Image courtesy of Library of Congress Known as “Battling Mary,” Mary Norton was a reformer who fought for the labor and the working-class interests of her urban New Jersey district. 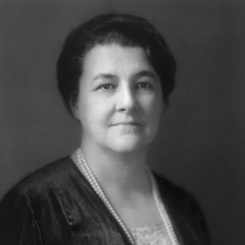 She was the first woman to represent an East Coast state in the House of Representatives. On this date, the Fair Labor Standards Act—widely considered the final major piece of New Deal legislation—became law. Shepherded through the Labor Committee by Chairwoman Mary T. Norton of New Jersey, the measure provided for a 40-hour workweek, outlawed child labor, and set a minimum wage of 25 cents per hour. Norton resorted to a little-used parliamentary procedure known as the discharge petition to force the controversial bill out of the Rules Committee—the panel that controls the flow of legislation on the House Floor. She convinced 218 of her colleagues (half the total House membership, plus one) to sign the petition to bring the bill out of committee to a vote. Although unsuccessful in her first attempt to pass the bill on the House Floor, Norton again circulated a discharge petition and managed to move a revised measure back onto the floor for debate. This time the act passed. “I’m prouder of getting that bill through the House than anything else I’ve done in my life,” she recalled.